A recent article in the Harvard Business Review (HBR) gives would-be business negotiators some general tips on how best to deal with counterparts from other regions of the world. After all, getting to yes and reaching a mutually beneficial agreement across all parties does require a good degree of cultural sensitivity and emotional intelligence. While there is no substitute to understanding other nations through travel and cultural immersion, the HBR article describes some interesting nuances to help those lacking in geographic awareness, international business experience, and cross-cultural wisdom. The first step in this exotic journey is rather appropriately, a map. No surprise, the Japanese and Filipinos shirk business confrontation, whereas the Russians and French savor it. Northern Europeans are less emotional, while Southern Europeans and Latin Americans are much more emotionally expressive. Negotiating with Filipinos? Be warm and personal, but stay polite. Cutting das Deal with Germans? Stay cool as ice, and be tough as nails. So what happens if you’re a German doing business in the Philippines? That’s not the question this map was designed to answer. This map — actually, a diagram — shows differences in attitudes to business negotiations in a number of countries. Familiarise yourself with them, then burn the drawing. From now on, you’ll be a master international dealmaker. 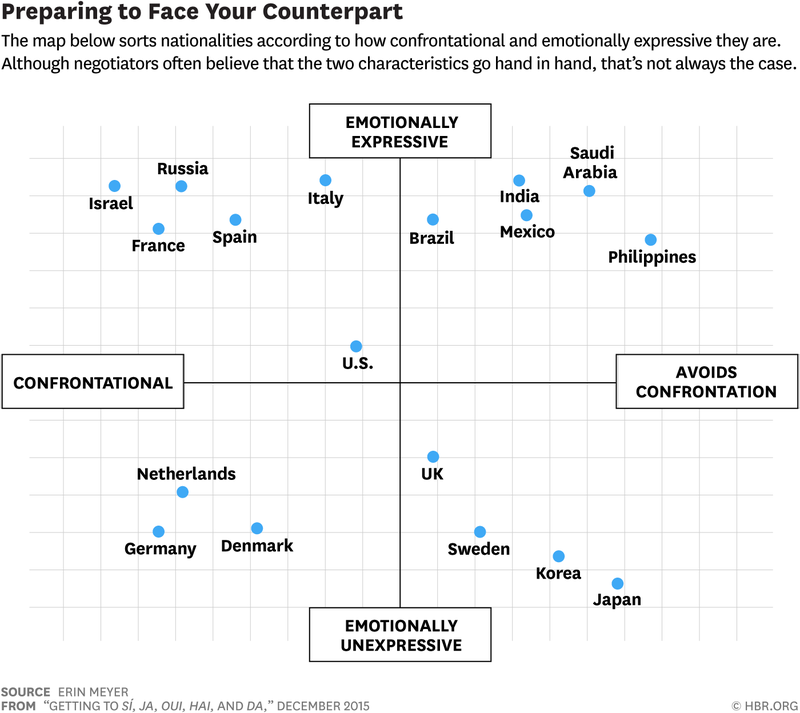 Vertically, the map distinguishes between countries where it is highly haram to show emotions during business proceedings (Japan being the prime example) and countries where emotions are an accepted part of il commercio (yes, Italians are emotional extroverts — also in business). The horizontal axis differentiates countries with a very confrontational negotiating style — think heated arguments and slammed doors — from places where decorum is the alpha and omega of commercial dealings. For an extreme example of the former, try trading with an Israeli company. For the latter, I refer you to those personable but (apparently also) persnickety Filipinos. Map courtesy of Erin Meyer, professor and the program director for Managing Global Virtual Teams at INSEAD. Courtesy of HBR / Strange Maps.